It's taken me ages to write this! It's supposed to be about who I am and what I do! Easy, or so I thought! Well, I am Andrew Brown the Beat Manager for Wincanton. Even that makes me realise just how much the Police force has changed. I have been a Police Officer for 20 years now. I joined when I was 31 years old. I had been a roofer before that, but a chance meeting with a Sergeant I met in the kitchen at a party (most of my decisions are made there!) made me realise there was more to life than falling off roofs. So I applied and got accepted. When I walked through the door at Yeovil Police Station it was the first time I had ever been in a police station. I had no ideas about what to expect and no pre-conceived ideas. Looking back at it I was incredibly naive, but it did help me. I found I could relate to people, and a lot better than some of my younger colleagues who knew nothing but studying at University and being in the Police. So where have I been? Well, I've worked at Yeovil, Shepton Mallet and Wincanton over the years. I also worked on the Crime Unit, 'bashing' in drug dealers doors. 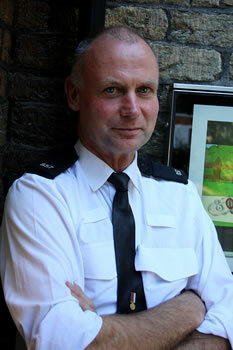 I have spent most of my career in Uniform and have always enjoyed being 'on the beat'. When I first joined we had a wooden truncheon and... Well that was it really. It taught me to talk myself out of problems. That truncheon really was useless!! I now have CS spray, body armour, ASP batten, leg restraints and rigid handcuffs... I have to carry all that round with me and I still rely on talking people round. When that fails - then I spray them! So now I'm a beat manager. Good grief what's that? Well it's a return to local Policing. The traditional bobby on the beat if you like. OK, so we will never get back to 'the good old days' but this is as near as we will get. I look after the Wincanton, Blackmore Vale and Milborne Port areas. It's is quite large, but I'm not alone!! There are three PCSO's who do the hard work for me. Jenny Maynard has Wincanton, John Winfield has the Henstridge, Templecombe area and Mandy Forsey has Milborne Port. Together we are part of the Neighbourhood Policing Team at Wincanton. We deal with local issues. These might seem quite trivial to some people, but sometimes they are what people find most annoying and upsetting. When it comes to serious crime the Police have always excelled. We tended to fail when it came to nuisance youths or littering and we didn't respond so well to local issues. Well we do now! We hold regular meetings and Beat Surgeries to meet people and get a feel of what the public want from us. Sometime we can help, sometimes not! Sometimes it's not even a Police matter, but we now work closely with all other agencies, like the Housing Department, Social Services and the Highways Agency... so between us we can usually get things sorted. I lived in Wincanton for 10 years and my children went to Wincanton Primary School so I have affection for the area. Well, I hope to type up more soon and explain more about what I do and what an average day is like. Until then keep safe. Wincanton is a really pleasant town and we have one of the lowest crime rates in the country (apparently!) So enjoy! !